The glitzy store and haute couture underscore a sharp strategic shift Pizza Hut is taking to revive its fortunes. The pizza chain has experienced tumbling same store sales this year that have dragged down Yum China's overall growth. "The brand needs to be somehow rejuvenated," said Leon Zhang, Shanghai-based partner at branding consultancy Prophet, highlighting a rise in health-focused consumers and a growing array of options for Chinese diners that have hit the chain. Pizza Hut has taken note. Alongside the tie-up with Sui - more at home at fashion shows in New York or Milan - it will open a test center for innovative products in Nanjing this week and roll out new "Kiosk" and "Express" store formats. Jeff Kuai, the pizza chain's general manager, said the brand had "streamlined" its menu and bolstered its online presence to catch up with its better-performing sister brand, fried chicken chain KFC. "We've learned a lot from the KFC turnaround and are making progress on all aspects of the Pizza Hut revitalization plan," Kuai said in comments sent to Reuters. "We are confident in our revitalization plan and committed to returning the brand to growth." 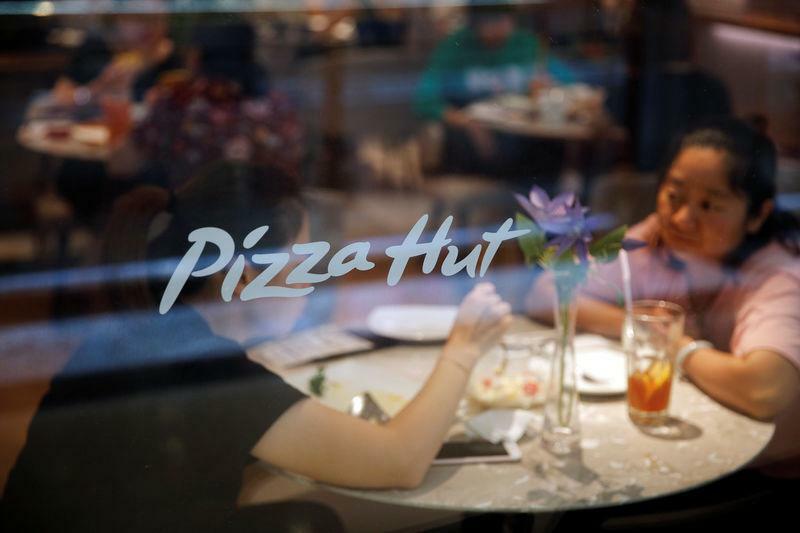 The Pizza Hut turnaround is not Yum's first salvage job in China. The firm had to restore confidence in all its brands after a food scare in 2012 and again in 2014. In 2015 it opened a high-end Italian restaurant as a test "lab" in Shanghai. While it has stabilized sales growth at KFC with upgraded stores, a big push on delivery and automated check-outs, Pizza Hut's 2,200-plus stores have proved to be more difficult to turn around. The chain has posted just three quarters of positive same store sales growth in China since the start of 2014. "At the moment they're really struggling to differentiate themselves enough to stand out from the rest," said Andrew Atkinson, marketing manager at Shanghai-based research and marketing consultancy China Skinny. "There isn't a clear message about why Pizza Hut is special and why Pizza Hut has a position in the space." Major rivals include Pizza Express, bought by Chinese equity firm Hony Capital in 2014, chains like Papa John's (PZZA.O) and Domino's Pizza (DPZ.N) and a growing array of smaller, local chains doing well with new products and helped by a boom in deliveries online. Pizza Hut's new-look for its stores and staff - which will be gradually rolled out around the country - could help the brand stand out more, analysts say. The shift comes at a critical time for Yum China, which recently rebuffed a $17.6 billion buyout from a Chinese-led consortium. Instead it has trendy, modern interiors, and popular dishes in China like omelet rice and Australian steak to attract younger consumers. Yum China's chief executive has described the push as helping make the brand "Instagram-worthy". "If I want to eat pizza I'll usually think of somewhere else. I'd rather pay a bit more to get a better pizza," she said. "Overall I think Pizza Hut is a bit expensive compared to other places with a similar quality product."